Come to explore beautiful & historic Wilmington, NC with a personal charter bus rental! Wilmington Charter Bus Company provides safe and reliable buses to groups of all types, guaranteeing an enjoyable trip to Wilmington for everyone. Call us at 704-302-1258 to book your own bus today! Trust Wilmington Charter Bus Company for all of your travel needs in and around Wilmington. 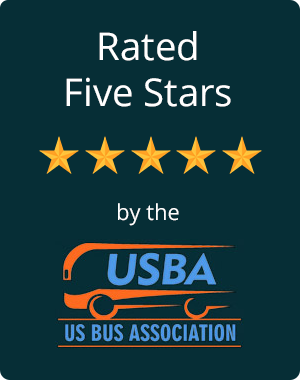 We’re committed to finding the best bus at the best rate for every group, regardless of their size, needs, or requests. That’s why we’re available 24 hours a day at 704-302-1258 to help you finalize every detail of your trip’s transportation. Call us today to start planning your trip! No matter the size of your group, we’ve got a bus that’s perfect for you. Book an 18-passenger minibus for a small group, a full-sized charter bus for a long-distance journey, or a 20-passenger or 25-passenger in-between bus to accommodate groups of any size. Amenity options include plush seating, large windows, on-board restrooms, and entertainment add-ons such as WiFi and televisions with DVD players. Let your reservation specialist know what your group would like to see on your private bus. We’ll find the one that’s perfect for you and pair you with a professional, experienced driver. You won’t need to worry about finding drivers, parking, or navigating unfamiliar roads when you book with Wilmington Charter Bus Company. Moving your group around at conventions, weddings, reunions, or other large-scale events can quickly become hectic. Let Wilmington Charter Bus Company handle all of the logistics of moving attendees between venues so that you can relax and focus on enjoying your event. If your event will take place across multiple venues, we’ll keep attendees flowing from your hotel to your convention center, wedding venue, or other destination. Your personal shuttle service will run on your schedule and make sure that all guests travel safely, arrive on time, and return home with ease. School events are easier with a charter bus. Take your students on a field trip to the Cape Fear Museum with a private bus. Students can stay entertained with on-board televisions while chaperones relax on the way to your field trip destination! Or, tour the University of North Carolina Wilmington with a personal minibus at your disposal. Your driver will make sure you arrive on-time for your official tour and will take you through town to explore campus and surrounding restaurants, parks, and other local stops. Need transportation for your sports team? Whether it’s for a school or for a professional league, we’ve got everything you need to transport players, coaches, and staff members with ease. You’ll have plenty of space for all equipment and luggage in your bus’s storage bays, leaving plenty of room for passengers to relax and enjoy the ride on the way to the next game. Call Wilmington Charter Bus Company to secure seamless, reliable transportation for your next trip. No matter what brings you into town, we’ll handle all transportation logistics so you can relax and focus on enjoying your time in Wilmington. Give our 24-hour team a call at 704-302-1258 to receive a free, personalized quote!